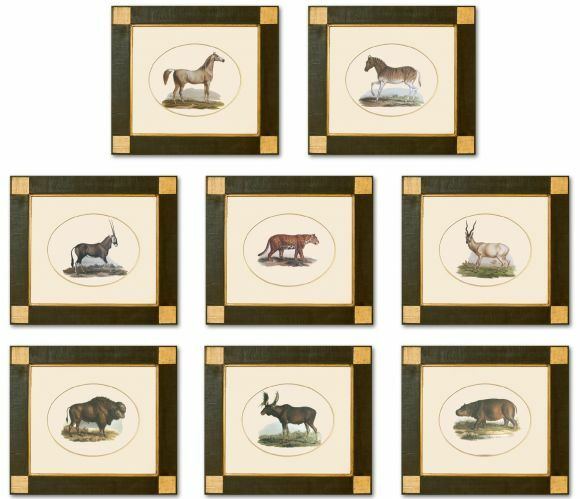 Description: Fitzinger Mammals in gesso mounts with handpainted gold bevels. All in deluxe handmade frames. Sizes & Prices . . .
Customise: Click a frame, finish or shape below, to change the image on your screen, or contact us to discuss your requirements. The Colours of Your Screen: The colours of your screen may be different to the colours on our screens. Before ordering this item you can request a printed visual to check the colours. Alternatively, you may send us colour swatches so that we can customise the colours of this item to suit your decor. The width of frame we recommend will vary depending upon the overall size of the piece. Our products are handmade to order. Finishes, and brushstrokes will vary slightly each time a piece is made. The exact design of the artwork may change with the shape. Custom sizes . . . The sizes shown are approximate. Please contact us if you need very precise sizing. Prices shown below are for each piece in the set. © Quintessa Art Collection 2019. All rights reserved. This information is also displayed on the bottom right side of your screen. the content of the Website includes paintings, drawings, photographs, sculptures, decoration, and other works of art and/or craft produced by Quintessa and its employees and contractors (the ‘Website Content’). the Website Content is protected by copyright law, registered and unregistered trade marks, database rights and other intellectual property rights. you may not copy, modify, publish, transmit, distribute, communicate, participate in the transfer or sale of, create derivative works from, or in any way exploit, any of the Website Content, in whole or in part, without Quintessa’s written permission except as expressly permitted under copyright law and other intellectual property law provided that you may print and/or download information from the Website for your own personal use in connection with the evaluation of Quintessa product.